If you haven't tried chimichurri sauce before, it's the bees knees! It's a traditional sauce from Argentina, commonly used in flavorful and heated steak recipes. I like to add it to this quinoa mixture because it compliments the sweet corn and bright cilantro flavors. Go ahead... try it! 1. Bring 2 1/2 cups of chicken or vegetable stock to a boil in a pot with a tight-fitting lid. Add one cup quinoa and return to a boil. Cover, reduce heat to medium-low and simmer until liquid is absorbed (about 12 minutes). Quinoa can easily burn—and sometimes it takes a bit longer to cook. 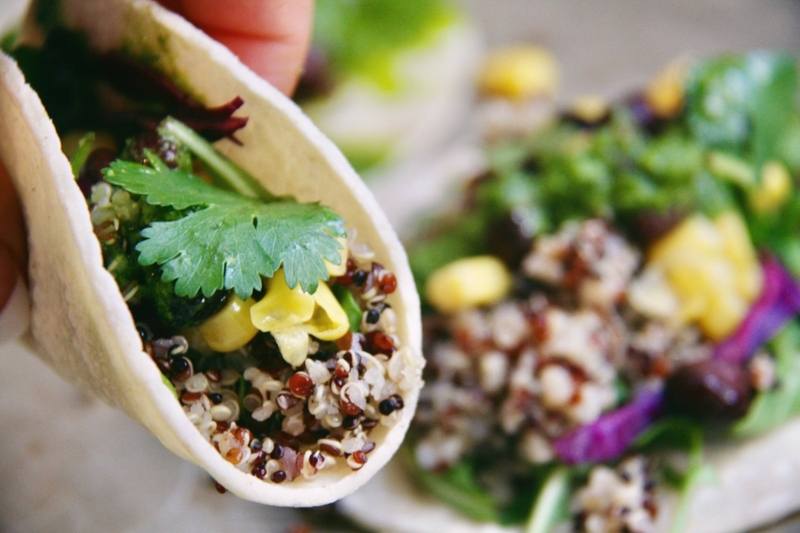 If you notice your quinoa burning, add more stock ¼ cup at a time until you reach the desired tenderness of the seed. When it has finished cooking, remove from heat and add quinoa to a large mixing bowl. 2. Wash, rinse, and remove seeds from bell pepper and Poblano pepper. Chop into small, fine pieces. Set aside. Chop onion and mince garlic. 3. Drizzle olive oil into a sautéing pan and turn heat to medium. Add minced garlic, onion, bell pepper, and Poblano pepper and sauté while stirring frequently, about 8 minutes (or until fragrant and soft). Add in black beans and corn. Finally, add in quinoa. Then, season with lime juice, sea salt, and cumin. Mix using a wooden spoon. 4. Make Chimichurri sauce, if desired. 5. Chop avocadoes on a small cutting board into small (1/4-inch) chunks. 6.Heat tortillas via stovetop or in the microwave. 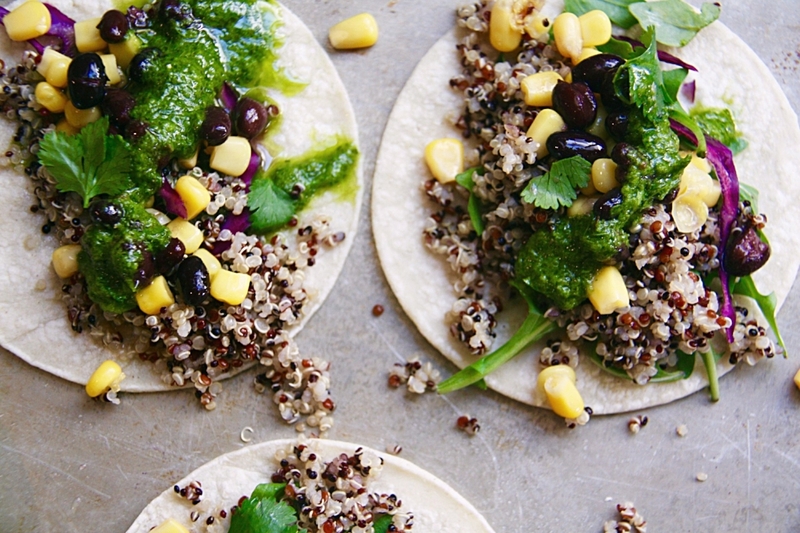 Scoop in fiesta quinoa mixture, drizzle with chimichurri, and add avocado to the top of each taco. Optional: top with cilantro and a scoop of nonfat Greek yogurt! In a blender or food processor, combine parsley, cilantro, garlic, salt, pepper, chili flakes, oregano, shallot or onion, olive oil, red wine vinegar, and lemon juice. Pulse for 15 seconds. Taste to test the flavor; add more oil to create a milder sauce, more garlic to jazz up the flavor, or more pepper flakes for heat. Set chimichurri sauce aside—or store in an airtight container for up to four days in the refrigerator.